Ricciardo Kart pair Troy Loeskow and Jace Matthews have continued their winning ways in the 2017 Australian Kart Championship in Geelong, Victoria. Round two of the five-event Championship, presented by Jayco and Castrol EDGE, had a strong weekend of racing throughout each category, producing outstanding racing for the big crowd on hand and the record live stream numbers. Loeskow’s second straight win in the KZ2 class came in a final that saw a turn one incident claim no less than eight competitors. Starting from pole position he quickly established an advantage over Daniel Price and was able to maintain the gap right to the chequered flag, securing the win over the CRG driver. Aaron Cameron had been in the thick of the action aboard his JC Kart throughout the weekend and he salvaged a hard fought third placing with Jason Pringle finishing fourth and Series stalwart, Sam Houston gaining a career-best finish in fifth. 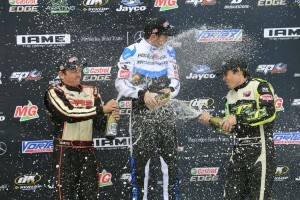 2011 Bathurst 1000 Champion, Nick Percat had an entertaining late race exchange with his Brad Jones Racing stablemate, Macauley Jones – with the battle of the Supercars drivers going the way of Jones after recovering from the turn 1 melee. 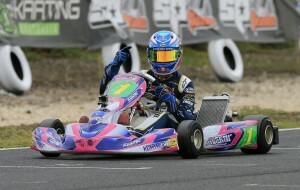 Continuing the good form of Ricciardo Kart in the Karting Australia Manufacturer’s Championship was Jace Matthews in KA1. Matthews backed up his Newcastle win to make it two on the trot since moving to seniors. KA1 was one of the more entertaining affairs over the weekend – whilst Matthews and defending Champion, Scott Sorensen were comfortable in first and second, third placed raged right to the end. It fell the way of Scuderia PCR driver, Kyle Henry-Smith, but it could have easily gone in many different directions. The second Ricciardo Kart of Thomas Steele, Ryan Sanderson’s Formula K and Matthew Stenner’s Kosmic all had dalliances with the final step of the podium. 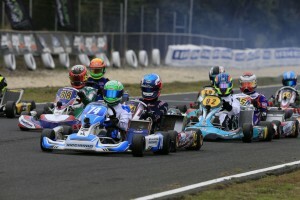 In KA2, the elite junior category, a two-kart battle was staged for the round win between defending Australian Champion Jack Doohan and Broc Feeney. Feeney led the majority of the race in his Kosmic before Doohan closed down and made the decisive move two laps from home. Christian Pancione in his FA Kart survived a late race surge from Jordyn Sinni to finish in third. KA3 Senior delivered the closest finish of the day with Leigh Nicolaou taking his Shamick Racing Arrow to victory by just a tenth of a second over Matthew McLean. Australian Champion McLean had to work hard to close the gap to Nicolaou and did so in the end, however it was the only race all weekend that McLean had been headed – those results keeping his Title defence well on track. New South Welshman Oscar Priest put a strong performance in to finish third. Joshua Car took a solid win in the TaG 125 category aboard his Comp Kart. The Sydneysider pushed hard to advance himself into the lead and had enough to outlast a surge by Queenslander Brendan Nelson. Nelson skipped ahead of a battle between Joshua Rogers and Paul Rodgers which lasted the entire 26-lap distance, which eventually fell the way of the latter. Nelson was again denied in the X30 final in what became a battle of the FA Karts. After leading early, he dropped to second behind South Australian Morgan Feast who took off at the front. Nelson’s biggest challenge came from West Australian Ben Harders – who also had a stint at the front of the pack. In the end, Feast led the FA Kart trifecta to take the second AKC round win of his career over Nelson and Harders, with Car coming home in fourth. In KA4 Junior, Kai Allen played his role perfectly in waiting until the final moments to strike. Weekend long combatants, Cooper Webster and Jay Hanson were battling up front for the lead with Zac Crichton and Kacey Mann playing a supporting role with Allen. Allen was able to close the gap to Australian Champion Webster and Hanson and then waited for the opportunity to snare the lead, this led to a wild sequence of events on the run to the chequers where Allen took the wind by 1.5 seconds over Webster and Hanson with Mann and Crichton close behind. 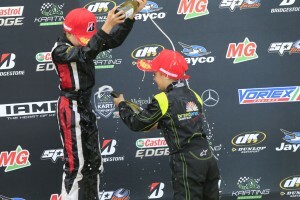 Cadet 9 provided a milestone moment for karting in Australia with the first graduate of the SP Tools Junior Sprockets program – Cadel Ambrose – taking the round win. It is the first time a ‘Sprocketeer’ has come through for victory at an Australian Kart Championship round and he did it with style. He outlasted several challenges throughout the course of the race, the most potent from second placed finisher, Shamick Racing pilot, Harry Arnett and Toby Dvorak – who came home third. In Cadet 12, James Wharton was able to extend his points advantage in the Championship with a dominant victory. His Shamick Racing FA Kart took the win by 3.228 seconds over Fletcher Harris who was comfortably in front of Marcos Flack in third. It was in fact the biggest winning margin of the weekend in any category. The Australian Kart Championship, presented by Jayco and Castrol EDGE and delivered by Mercedes-Benz Vans now moves to Monarto (just outside Murray Bridge) in South Australia over the weekend of May 26-28.